 Though it’s a modern truism that boatbuilders favor bigger boats because they make more money on them, several production builders have recently begun introducing some smaller models to their product lines so as to attract new and younger sailors to the sport. 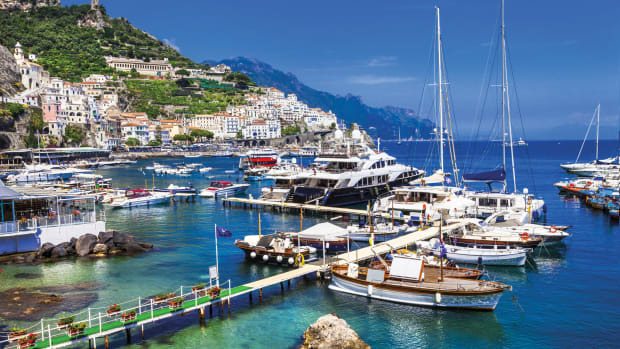 Among them is Jeanneau with its new Sun Odyssey 319, now the smallest in its storied line of cruising boats and a welcome addition to the market. 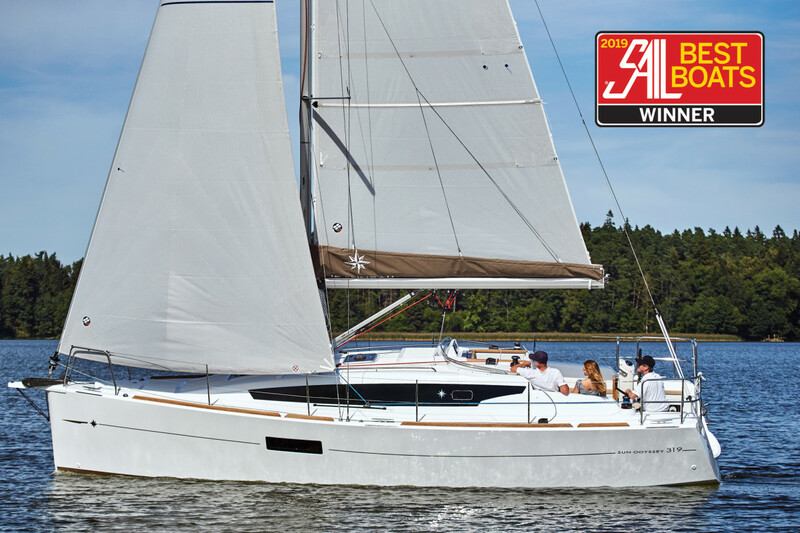 In fact, it scored a win in SAIL’s 2019 Best Boats competition, in the 31-40ft Cruising Monohull category, due to its all-around handiness and its great use of interior space. Though based in part on the Polish-built Delphia 31, the Sun Odyssey 319 incorporates an all-new hull design featuring a more rounded bow forward above the entry and some crisp hard chines aft. Twin rudders are also standard. The hull is comprised of a solid fiberglass laminate set in polyester resin, with a balsa-cored deck that is both bonded and screwed down as part of the hull-deck joint. Ballast is cast iron, set in a conventional fin keel with a bulb, or in a stub wing keel from which a centerboard descends. Our test boat came equipped with a wide-open transom (a fold-down transom is also available), a fold-down cockpit table, a steering pedestal with a large instrument pod and an optional folding Lewmar steering wheel. The latter is an especially good idea, as otherwise the only way to get all the way aft is to hop up and around the helm on the cockpit seats, something many will consider a hassle. The seats themselves are generously proportioned, a good 7ft long, with high cockpit coamings that provide good back support to anyone forward of the wheel. Beyond that, the cockpit is well thought out in general, with a large one-piece companionway washboard that stows away neatly in a slot in the companionway’s sliding hatch garage (a nice feature). There is also a good deal of space overall, especially given the boat’s size. The jib sheets are led straight back to a pair of Harken 35 cockpit winches, situated to either side of the wheel. In the standard configuration all lines from the mast, including the mainsheet, which runs off the boom via a small bridle on the coachroof, are led to pair of Harken 20 winches perched either side of the companionway. 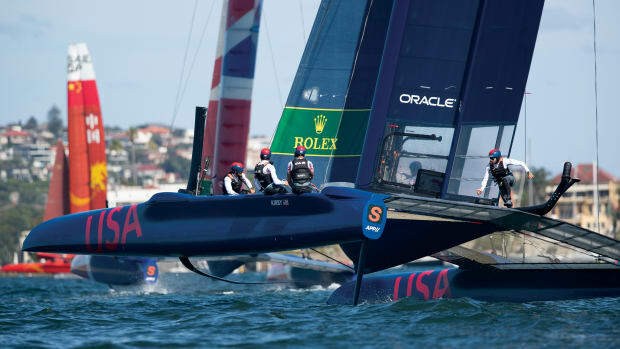 My one quarrel with the layout on our test boat was the mainsheet arrangement. On a boat this size you want to be able to easily reach the mainsheet from the helm. I would therefore definitely go for the optional double-ended German mainsheet arrangement, in which the tails are led to the cockpit winches. Moving forward you’ll find some nice easy-to-grab stainless steel handrails on the coachroof, which is quite tall for a modern boat. You may also grumble a bit as you swing inboard of the inner shrouds that cut right across the sidedeck at an inconvenient angle. However, such obstructions are now commonplace aboard smaller boats with super-wide sweptback spreaders supporting their masts. This is where the boat really shines, as the amount of livable space below, given the boat’s LOA, is impressive. Thanks to that tall coachroof, there is serious standing headroom, 6ft 4in or better, throughout the interior, including even in the forward stateroom. Here you’ll find a proper-sized V-berth that is long enough and wide enough for two normal-sized people to sleep on. As such, it compares very favorably to those modern small cruisers aboard which the forward berth is far too cramped to be useful. Moving aft to the saloon you’ll not only find a fairly conventional layout, but sufficient space for it to all work properly: included are two full-length settees that can be used as proper sea-berths, a drop-leaf centerline table, an L-shaped galley to port and a small chart table to starboard. 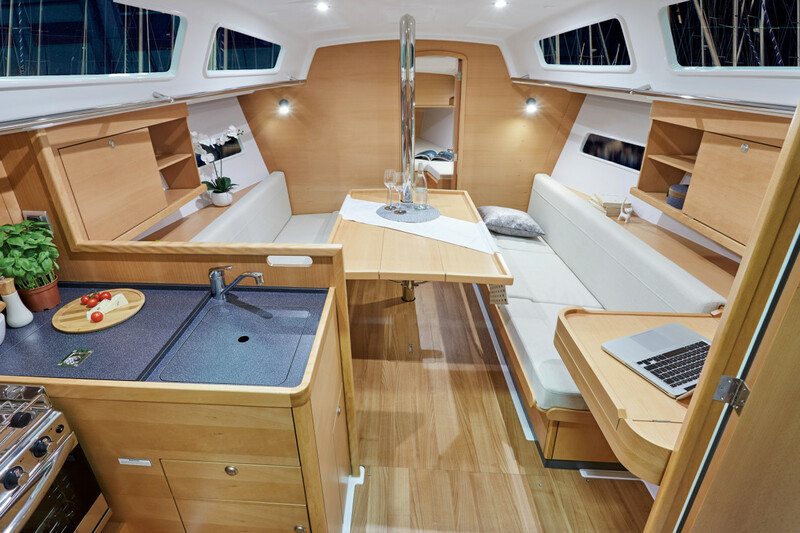 Granted, the galley is a bit cramped, with a small two-burner Eno stove and a big top-loading fridge whose lid offers the only usable counter space. But again such compromises must be accepted on a small boat. In terms of ambiance, the overall space seems much larger than it is, thanks to all the natural light pouring in through portlights in the cabinhouse and hull sides. Moving even farther aft there’s a surprisingly large stateroom to port, with great vertical clearance over a large double berth, and to starboard isa small, but very adequate head. Throughout the boat there is more-than-adequate storage, a nice touch. Bottom line: this is a boat that can honestly accommodate four people for extended cruises and six people for shorter trips of two weeks or less. 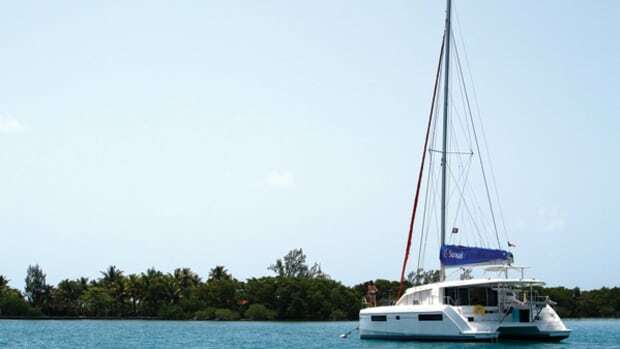 The sailplan on the Sun Odyssey 319, set on a Seldén mast with canvas by Technique Voile, is quite versatile and can be configured in a number of ways. 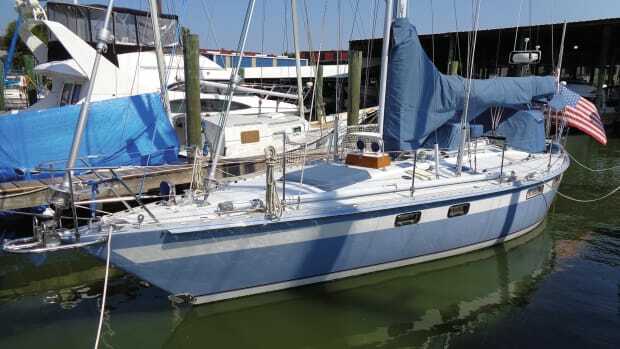 The standard plan calls for a “classic” slab-reefed mainsail and an overlapping genoa flying on the headstay and sheeting to tracks on the sidedecks in the conventional manner. 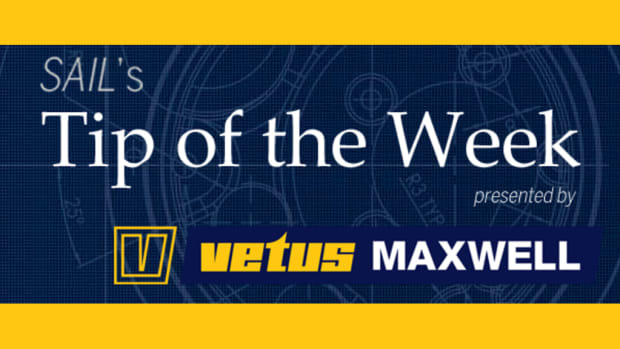 Another user-friendly “de-powered” plan boasts an in-mast furling mainsail and a small self-tacking jib forward. There is also an option for a bowsprit, from which you can fly either and asymmetric spinnaker or Code Zero-type headsail. 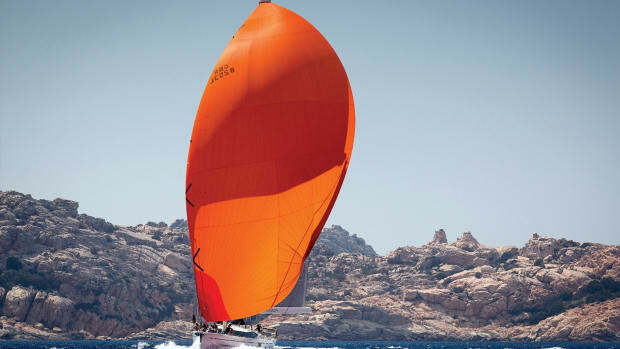 Finally, there is a third alternative (and the one I would personally favor) the classic mainsail with a self-tacking jib and the sprit for flying big light-wind sails both upwind and down. Unfortunately, we had the de-powered sailplan on our test boat, which I have to say, you should only specify if you are physically incapable of handling anything more. On a boat this size conventional sailhandling chores will never seem onerous, and the reward of a conventional main, in particular, cannot be overstated. In our case, with a roachless main and a tiny sliver of a jib sailing in 8-10 knots of wind, we struggled to get moving at better than 5 knots. Most of the time we were in the low-to-mid 4s and quickly fell below that when we turned downwind. Toward the end of the test, we saw a steady 12 knots of wind, and I was able to get some sense of what the boat is capable of. The good news is that at all times the boat felt both nimble and light. (Although, again, she definitely wanted more sail than we were flying.) In the stronger wind, we brushed 6 knots sailing at an apparent wind angle of 45 degrees, which dropped off to just below 5 knots when we pinched to 40 degrees. Our test boat, which came with the fixed keel, also tacked easily and lost little way coming through the wind. Bearing away in a puff onto a shallow broad reach we were able to keep the needle hovering at 5 knots. The only powerplant available is a 21hp Yanmar diesel set over a saildrive, with a Flexofold folding propeller available as an option. Unfortunately, the engine space is where the small size of the boat is most noticeable, as it is cramped enough to make routine maintenance a challenge. Access to the oil filter, for example, is poor, and to gain full access to the raw-water pump impeller housing you need to first remove the battery. Underway, we made 5.6 knots at a cruise setting of 2,200 rpm and topped out at 7.8 knots with the throttle wide open at 3,700 rpm. With her twin rudders, she’s one of the quickest turning sailboats I’ve handled and also backed down very well and in full control. 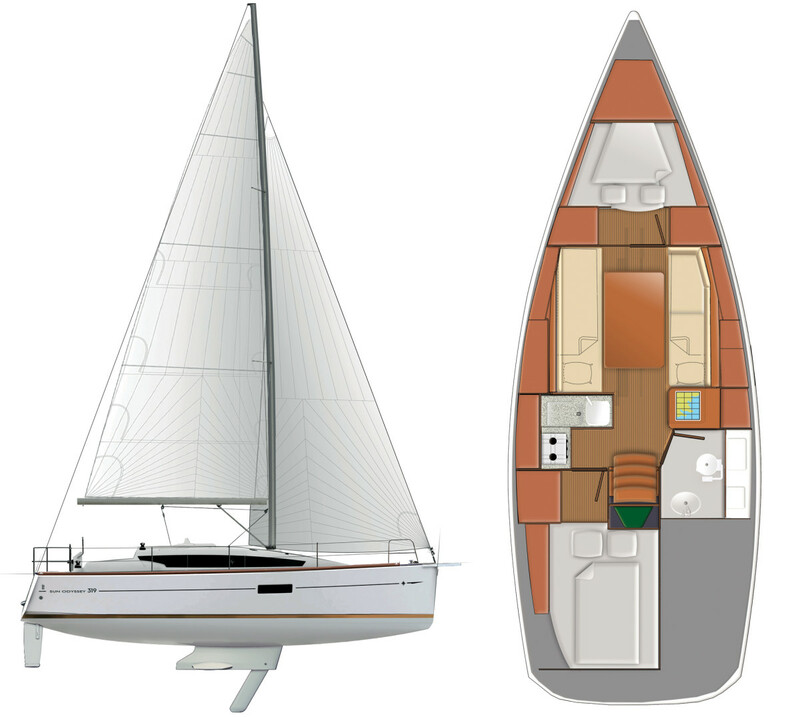 For anyone looking for a modern compact cruising sailboat this is a hard vessel to ignore. 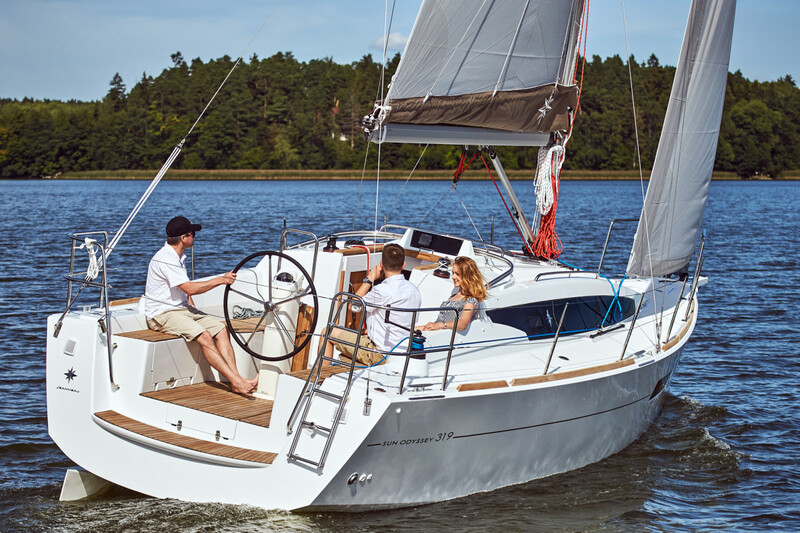 With its versatile sailplan, deep and shoal-draft options, comfortable spacious cockpit and eminently functional interior, the Sun Odyssey 319 makes for a great starter boat for a young family or a couple. 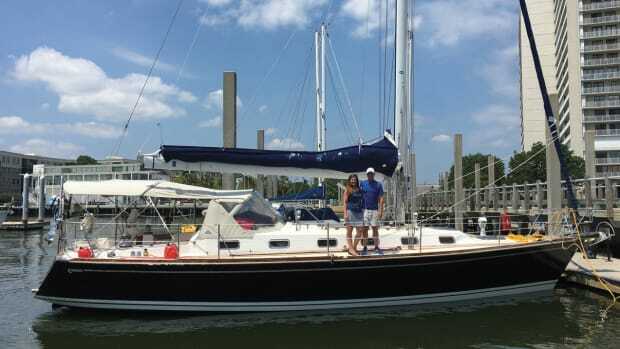 It would also be a great retirement boat for older sailors looking to downsize from something larger.